Plymouth-based five-piece fronted by Irish-born vocalist and guitarist Michael Mathieson. Mad Dog Mcrea blend a unique mixture of folk-rock, pop, gypsy-jazz, bluegrass and with uptempo energy. 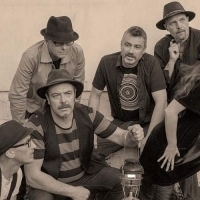 From self-penned songs of adventure, drinking, love and life, to traditional songs of gypsies, fairies, legless pirates and black flies - Mad Dog never fail to capture their audience with their infectious songs.